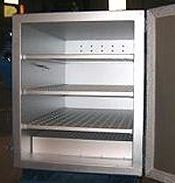 For Keen custom industrial ovens, fabrication and design of shelving is specific to the customer’s process and can consist of flat perforated, removable, vertically adjustable, cradled, stackable baskets, trays and much more. 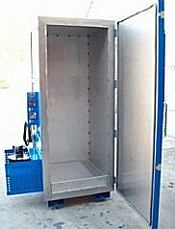 Shelving in our line of welding consumable storage ovens is specific to the type of consumable being stored and storage capacity. 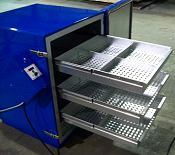 For example, our flux-cored wire storage ovens have cradled shelves for storing round wire reels, and our stick electrode storage ovens have a specific design to suit electrode storage. 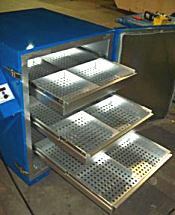 Any of our standard welding ovens can be outfitted with different shelving if desired. 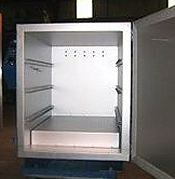 To help us design shelving for your Keen industrial oven, all we need are some verbal descriptions of your objectives, or rough sketches of the proposed design to work up a formal CAD drawing and/or quotation. If you would like assistance with designing a shelf arrangement to suit your application, please call us. 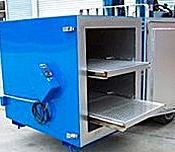 Our expert craftsmen would be pleased to find a solution for you. 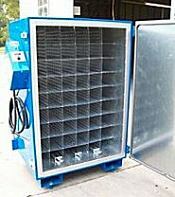 Please call us toll-free at 1-888-512-2870 or local (985)345-2171.